Traditional procurement processes do not consider ethics, integrity and compliance risks in the supplier evaluation process, and that puts your organisation at significant risk. We recommend a comprehensive evaluation of risks that look across all 23 risk areas that could impact your business. The Red Flag Group® has identified 23 risk areas that should be part of every compliance risk management assessment. Organisations should consider the business impact of these risks when engaging a supplier to protect themselves from ethics, compliance and integrity risks. These risks are regulated by laws across the globe and largely cover financial crimes committed by organizations and individuals. Focused on risks related to fair working environments for third parties’ employees and conduct that could impact the reputation of downstream customers. The potential for harm over the mishandling of company, customer and product data can cause irreparable damage to an organisation. Organisations must ensure control and management of natural resources and potential environmental impact throughout their supply chain. Supplier Integrity® is a dedicated risk management system that allows you to assess potential suppliers for compliance, integrity and reputational risks; know when to walk away and when to run. The onboarding process provides a comprehensive audit trail of steps taken to identify, assess and remediate any concerns, giving you the comfort of proof-of-process and a defensible position should anything go wrong. Supplier Integrity® has our proprietary Risk Analyser built in, which displays an individualised risk assessment across the 23 risk areas for each supplier. The risk score allows the assignment of suppliers to risk tiers, and supports a risk based onboarding program for assessing compliance and integrity risks. 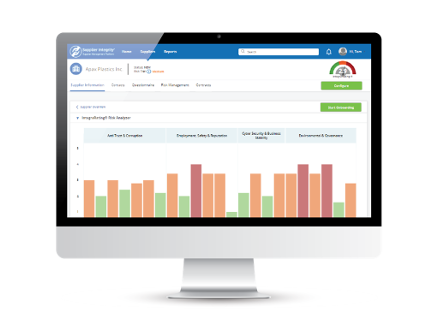 The risk score will drive the dynamic onboarding workflow, ensuring consistent application across your supply chain that is relevant to the risk of a supplier. Click here for a free whitepaper explaining the 23 risk areas.